Home > Blog > Happy Birthday Aquarius! Happy Birthday to all the awesome Aquarius' out there! If you need a birthday treat for an ace Aquarius in your life or want to treat yourself check out our embroidered Aquarius pouch! 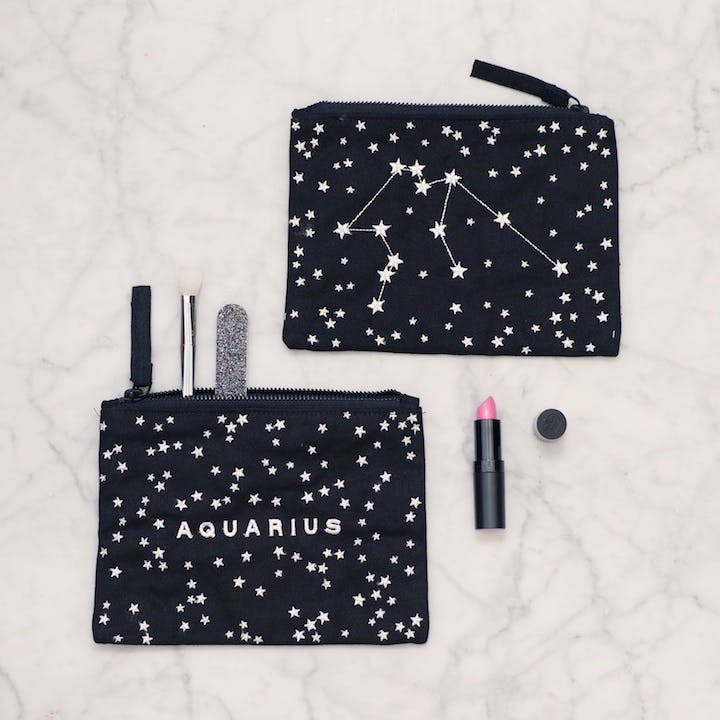 Each beautiful zodiac constellation has been embroidered in white cotton on a heavy black canvas pouch, complete with a black metal zip and canvas zip pull. The pretty starry background continues around the edge of the pouch and onto the reverse, where the name of the zodiac sign has also been embroidered. These little pouches are terribly handy, perfect for storing all sorts of bits and bobs, from make up to money and all other handbag essentials. They also make a rather lovely pencil case! Check out the Aquarius pouch by clicking here. Wishing every lovely Aquarius a very Happy Birthday and wonderful fun-filled 2017!